This product consist of 26 uniquely designed, 3D rendered vtt tokens, depicting both heroes (Merisse Truestrike, Tiefling Caster, Northerner with Axe, Warrior with Medium Armor and Shield, Helgagilden Pennypouch, Golden Warrior, Heinrich Loquesmith and a Half-Orc Avenger) and villains/monsters(Gargoyles, Hill Giants, Eye-Horrors, Crysmal, a Demi Lich and Sea Hag). 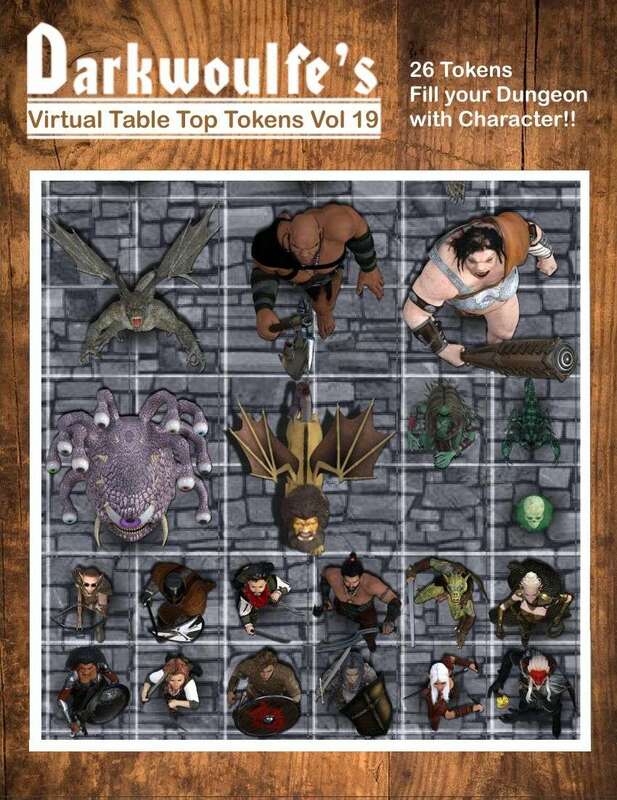 These tokens are suitable for use with any fantasy role-playing game and are optimized for virtual table top (VTT) play. This title was added to our catalog on June 10, 2016.